There's a lot of mystery and mystique surrounding SWAT teams around the world. These highly trained, elite law enforcement specialty units have at their disposal a host of tools and tactics to make them ready for the most dangerous and volatile of situations that may require police action. You might even call them the Navy SEALS of policing, which is why any police officer who is honest with themselves will likely admit that they've had dreams of making the team at some point in their career. So just how do you become a SWAT team member? If you meet the minimums, you'll undergo an extensive background investigation process, and you'll need to complete police academy training. Once you've gotten hired as a police officer, you'll typically need to serve for at least two years and perhaps longer before you are eligible for any specialty units, including SWAT team positions. If you've got the requisite experience, you'll be eligible to try out when a position becomes vacant. SWAT team try-outs are intense and will require everything you've got, both physically and mentally. Perhaps the biggest challenges for aspiring SWAT team members are the physical requirements. SWAT officers have to be in the absolute top physical condition in order to perform the many functions they may be called to handle. For that reason, SWAT team physical assessments measure the strength and endurance of potential new members. Swim 200 meters in 7 minutes. Keep in mind that these are only the minimum physical requirements to be considered for the team, and this is just one agency. Different agencies may have slightly different requirements, but the fact remains that you will need to get in shape and stay in shape to make it in SWAT. Most of the emphasis for SWAT team tryouts and selection is placed upon physical fitness, but there are other considerations, as well. SWAT members must be an expert marksman, able to think quickly on their feet, take and give orders, communicate effectively with others, have a strong sense of teamwork, and be mentally tough. In many cases, an officer's prior work history and performance with the department will be taken into consideration when choosing SWAT members. SWAT team members are considered to be elite within the ranks of law enforcement agencies. These units are highly cohesive teams in which every member plays a vital role in advancing the mission of the group. 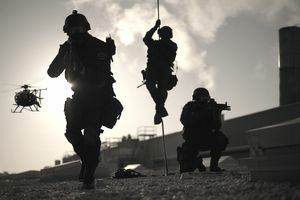 It takes a tremendous amount of dedication, determination, and hard work, but if you have a strong sense of team and self-sacrifice and you think you can muster the mental and physical strength needed to make it on the SWAT team, then you may just find it to be the perfect criminology career for you.